This collection consists of records relating to the Commission on the Roles and Capabilities of the U.S. Intelligence Community; more often referred to as simply the Aspin-Brown Commission. 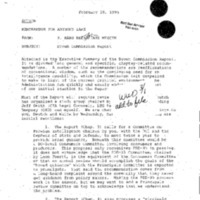 The Commission was authorized in 1994 following an October 1993 incident in which 18 U.S. Army soldiers were killed by soldiers of a Somali warlord. 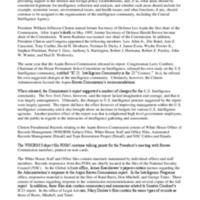 The intent of the Commission was to assess the status of the changing intelligence community following the Cold War and to offer suggestions on how to adapt. 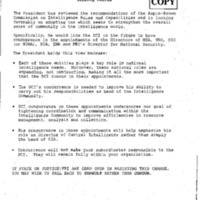 It released its report, Preparing for the 21st Century: An Appraisal of U.S. Intelligence, on March 1, 1996. This collection consists primarily of records relating to the administration’s response to the completed report and copies of the report. 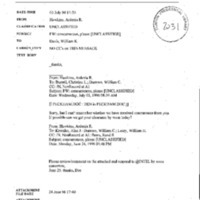 It also includes administrative email relating to the business of the commission.